Are designer molecules poised to take us into a new chemical dimension? This week, we explore how, long before the bunsen burner gets lit, computer aided chemistry can enable us to create in silico imaginary new molecules, reactions and designer catalysts. We also delve into how chemicals are manufactured on a massive scale with a visit to a plant making zeolites. And in the news, how hydrogen-metabolising bugs can supercharge deep-sea mussels, how reprogrammed immune system cells can hunt-down cancer, and nature's stock exchange - how plants and fungi develop a subsoil free-market economy to trade resources. 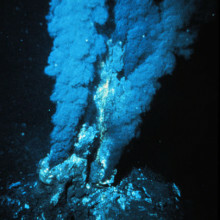 Hydrothermal vent mussels have been found to host hydrogen-powered bacteria in their gills. Mussels flourishing in the dark ocean depths at hydrothermal vents harness energy from hydrogen, thanks to symbiotic bacteria acting as 'fuel cells' inside their gills. This discovery unveils a third energy source, alongside sulphur compounds and methane, that power these sunlight-starved ecosystems in the deep-sea. A research team led by Jillian Peterson and Nicole Dubilier from the Max Plank Institute for Marine Microbiology in Germany, explored a hydrothermal vent field called Logatchev at the Mid-Atlantic Ridge 3 km beneath the waves. Superheated water gushing from these vents has the highest hydrogen levels ever measured in hydrothermal systems. Peterson and the team wondered if any organisms were tapping into this potentially rich source of energy - hydrogen is a great electron donor and the energy released by hydrogen oxidation is much higher than for methane or sulphur. To find out, they sent down remotely-operated submersibles that brought up living samples of mussels, called Bathymodiolus, that cluster around these vents. Back on deck, researchers discovered that sulpur-oxidising bacteria living inside the mussels' gills can also be powered by hydrogen. They have a gene, hupL, that codes for a key enzyme involved in harnessing energy from hydrogen, which essentially breaks down hydrogen molecules into two hydrogen ions plus two electrons. The team also showed that Bathymodiolus mussels mop up large amounts of hydrogen both in the lab and using in-situ equipment back down at the hydrothermal vent. They found that hydrogen levels were much higher in water spewing straight out of the vent compared to water after it had passed through a dense bed containing up to 500,000 mussels. Until now, only free-living bacteria have been shown to use hydrogen as an energy source. Other animals - including the giant tubeworm, Riftia, and the shrimp Rimicaris exoculata - live around hydrothermal vents where hydrogen is less abundant than at Logatchev but it turns out they also have hydrogen-harnessing capabilities. They too host symbiotic bacteria with the hupL gene, suggesting that an ability to harness hydrogen is widespread across vent communities. The paper appears in this weeks edition of the journal Nature. For the first time, scientists have used genetic engineering to reprogramme immune cells to successfully eliminate tumour cells in one form of human blood cancer. Writing in Science Translational Medicine, University of Pennsylvania scientist Michael Kalos and his colleagues collected T lymphocytes, a form of white blood cell, from three patients suffering from the disease B cell lymphocytic leukaemia (B-CLL). 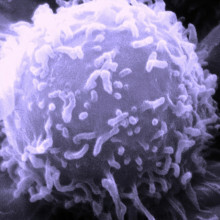 In cell culture, a modified virus similar to HIV was used to add to the T cells genetic sequences encoding a signal called 4-1BB, which encourages active T cells to proliferate, as well as an antibody-like structure that could selectively recognise a chemical marker called CD19 that is expressed by the malignant B cells. Between 10 million and 1 billion of the reprogrammed T cells were reinfused into each of the patients, in whom they persisted at high levels for at least 6 months, relentlessly hunting down and destroying the leukaemic cells in both the blood, bone marrow and lymph nodes. Follow up tests showed that each infused T cell destroyed at least 1000 leukaemia cells, leading to the destruction of an average of over 1kg of cancerous tissue in each of the patients, two of whom went into complete remission following the therapy. Previous attempts to use this sort of adoptive immunotherapy, as this approach is known, have been frustrated by the poor long-term persistence of the modified T cells in circulation. This allows the underlying disease to "escape" again, triggering a relapse. But the researchers believe that the key to their success in this case was the use of the additional regulatory 4-1BB component, also known as CD137. By including this, they think, the modified T cells are stimulated to multiply as they fight the disease, helping to prop-up their numbers. It's not all plain sailing though. Whilst targeting CD19 ensures that the modified T lymphocytes attack only B cells, this means that healthy, non-cancerous B cells are hit too. And as these cells play an important role in immune defence, including producing antibodies and providing a stored "memory" of infections fought previously, their loss can leave patients vulnerable to infection. This could be avoided in future by developing ways to target the T cell attack exclusively to the malignant cells, but this is still some way off. It's also important to emphasise that the present trial involved just 3 patients who have been followed up for just under a year so far. The study results therefore need to be interpreted cautiously, although with optimism. Chris - We're joined by Dr. Morris Bullock, one of the scientists behind the work. Hello, Morris. Chris - Thank you for joining us on the Naked Scientists. Kick off if you would, and tell us, what was the actual goal of the work when you started? Why were you doing this? Morris - The goal of our research is to develop ways to convert between electrical energy and chemical energy. And the reason is that we all hope that in our future we'll be using a lot more renewable sources, such as solar power and wind power. To make that as effective as possible we need to have ways to store the energy. Of course there are going to be times that we want to have energy usage or electricity available when the sun's not shining, or when the wind is not blowing, and so it's important to have a greater use of these renewable sources, and that we find a way to convert electrical energy to chemical energy. Chris - So in other words, you put the electricity into hydrogen, and you want to be able to do that efficiently, and then get the energy back out of the hydrogen again later when the sun's not shining. Morris - That's exactly correct. We're taking electricity. We're doing an electrochemical experiment. We convert the electricity; we take two electrons and two protons and we convert them into hydrogen. That way we store the electrical energy in the form of a chemical fuel that is, in our case, in hydrogen. Then we have that hydrogen. It would be available at the time that you need electricity, and then we would run the reaction in exactly the opposite way. That's what happens in a fuel cell, you run hydrogen into the fuel cell to get electricity back out. And so, the catalyst that we just recently developed converts electricity into hydrogen much more quickly than the previous catalysts. Chris - What exists in nature to do this and what's wrong with the natural form? Why can't we just use that? Morris - Well, the ones that nature has are amazingly efficient. 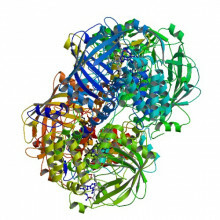 They're terrific catalysts, but they exist in hydrogenase, that's found in microbes, and that kind of thing in nature. The problem is they exist in a very specific biological environment and are not often that stable outside of their natural environment. Chris - So what is it that you've been able to do and how have you used what those bacteria, those microbes with hydrogenases, do to inform building this new catalyst? Morris - What we've done is to look at what the hydrogenase enzymes look like. Then what we tried to do is to emulate just the important functional features. 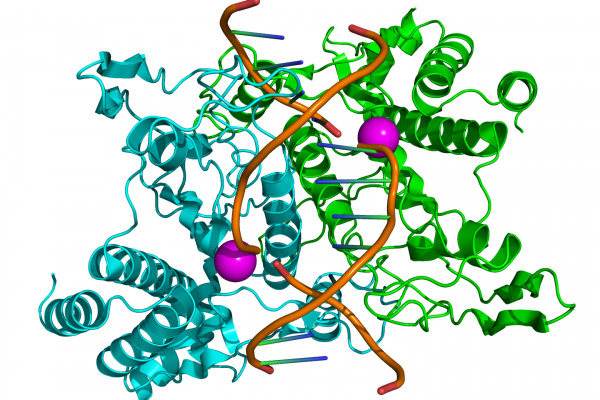 In particular, we know that the hydrogenase enzymes are based on metals like iron or nickel, and so these are cheap metals as opposed to a precious metal like platinum. The second key feature of what we've seen is that one of the key chemical features of the hydrogenase enzyme is what we call a pendant amine. That's just the nitrogen containing group that has a basic site and that helps to move the protons. What we've done is to incorporate that amine functionality, that basic site to move protons into the structure, and we found that being able to move protons more efficiently makes a huge difference in having a fast catalyst. Chris - So rather than having to rely on an enzyme, which is protein based and therefore more difficult to work with, you've been able to make a solid state. Basically, a crystal architecture, with various chemicals in just the right places to do this chemical reaction. But how do you build that catalyst? How do you get those chemical groups, including the nickel and the iron you mentioned, in just the right place? So that the reaction happens as well as it does, or better, with the enzyme, but without having to use an enzyme? Morris - These were just made up in the laboratory, so these are completely synthetic molecules. We assemble a ring containing two phosphorus atoms to bind to the metal, and then between the two phosphorus atoms is a nitrogen that has the amine. And so then we attach that to a nickel. In this case it's just a nickel catalyst, not any iron involved in this so it's just one nickel molecule that has two - what we call ligands - that is a chemical attachment to the metal, and has the amine attached. We synthesise that in the lab and then we do the experiments where we look at the conversion of electricity to hydrogen. Chris - And how good is it compared with what microbes can do? Morris - The fastest reported rate for natural hydrogenase enzymes is a turnover - that's we call the turnover frequency - of 9,000 per second. The one that we have recently made turns over at 100,000 times per second, so it's approximately 10 times faster than the natural hydrogenase enzyme. Chris - And is it economically and scientifically viable to actually make this stuff on the kind of scale that we would need if we were to try and do this industrially? Morris - I think this one would not be economically viable to use in its present form. We're studying fundamental science and we think that the discoveries that we've made will be helpful in showing us how to take the next step of making one that would be even better, but even though this is a very fast rate, the efficiency is not good enough at this point to really make it so viable for implementation in an industrial type of setting at this point. Chris - So a little bit more work to do, but still, congratulations - a wonderful study. Morris Bullock there. He's from the Pacific Northwest National Laboratory in Washington State and you can find that paper published this week in the journal Science. It's not just humans that create market economies, exchanging one set of goods for another - plants and fungi also barter nutrients with deals kept in check by market forces, new research has revealed. Writing in Science, Vrije University researcher Toby Kiers and his colleagues show how the roots of plants feed sugars to soil-dwelling fungi in return for phosphorus and other nutrients they can't make themselves. 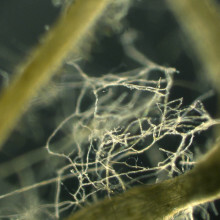 This means that plants can effectively make use of the extensive, branching subsoil network of fungal hyphae almost as an extension of their own root systems. But it's not a simple case of give and take: plant roots can discriminate between more or less generous partners and pay higher sugary prices to those fungi that are more generous with their nutrients, and vice-versa. Consequently, cheapskate fungi are priced out of the market by their more generous counterparts. The team made the discovery by using radioactively-labelled carbon and phosphorus to follow the exchange of materials between a small clover-like plant called Medicago truncatula and three closely-related species of fungi, Glomus interadices, Glomus aggregatum and Glomus custos. In an initial series of experiments, the plant roots were grown in isolation on a Petri dish with each of the different fungi in turn. Glomus interadices, the team found, consistently provided the plant with more phosphorus and was consistently rewarded with bigger rations of sugar. Glomus aggregatum was less forthcoming with its phosphorus and consequently received low sugar payments, whilst Glomus custos was downright selfish and supplied the phosphorus in a form that the plant couldn't use and so received little reward in return. But when the three species were grown together with the same set of roots, would the plant be able to tell who was short-changing it and so apply a penalty to the offender? Incredibly, the answer is yes. When all three fungi were co-cultured alongside the same set of roots, the less generous fungal species were consistently less well rewarded than their more generous counterparts, which effectively priced them out of the market, becoming the dominant nutrient supplier within a short time. This shows that these sorts of mycorrhizal relationships between plants and fungi, which are thought to have existed for more than 470 million years and may even have enabled plants to first colonise the land during the Devonian era, represent a genuine subsoil free-market economy that Barrack Obama would be proud of! Tim - The Atlantic Forest of Brazil is among the most diverse ecosystems on earth. Here, for example, you can find almost a thousand species of birds, and more than 400 tree species have been found in a single hectare. Thanks to DNA sequencing, researchers like Marcia Lambas are now able to uncover a whole new dimension to that biodiversity. Marcia - What we've found here is that every single tree species it has its own bacterial community that lives on the leaves, and we found the same thing for the bacteria living on the bark, and associated with the roots. We have estimated that each single tree species has approximately 500 or 600 different bacteria species living on the leaf surface. Tim - Just on the leaf surface? Tim - And then when you go down to the bark? Marcia - Oh, then you have another maybe 200, or 300. If you go down to the roots we have something around a thousand, or even more than that. 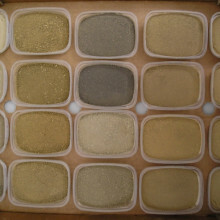 Rob - What we have here is a representative sample of the UK's soils, in three boxes. Tim - I've swapped the heat of the rainforest for a freezer in the Centre for Ecology and Hydrology in Oxfordshire, where Rob Griffiths is using similar techniques to look at the diversity of microbes in British soils. Rob - Each sample has got a barcode on it. We've got good tracking from exactly where the sample was taken in the field: information that was collected as part of the countryside survey on the kinds of plants that were there, climate, GPS location. Tim - Okay, well it's getting a little bit cold in here, so why don't we shut up those boxes and continue our conversation outside, before we all freeze to death. Rob - Here we are in the laboratory now. We have very small tubes in a freezer where we've weighed out the soil. Basically, what we want to do now is extract the DNA. So all the DNA that's in the soil. Tim - That means you're not looking at individual organisms, you're looking at the total DNA of what's inside, is that right? Rob - Yeah. We don't really get to see any organisms. But we do know that even a cell that looks identical to another cell could have a completely different genetic makeup. The only real way, unfortunately, that you can look at the ecology of these organisms, is to look at their DNA. Tim - Next question, which is the difficult one, why does it matter? The more we know about this stuff, how potentially might it help us in the future? Rob - Well, this is the fundamental question. Once we know where we find different types of microorganisms, we can start doing the really fun science, which is looking to see if it does matter if we find a different diversity in one soil compared to another soil. Tim - So it could help, for example, to understand the human impact on the environment? Rob - Yeah. Exactly. The human impact on the environment is the way we manage the land, affecting microbial diversity. Is that going to have any further consequences in terms of, for example, greenhouse gas cycling, which microbes in soil are very important regulators of? Tim - The samples from the countryside survey will form part of an ambitious project to build up a global picture of microbe biodiversity - a kind of microbe atlas of the world. The Earth Microbiome Project is being coordinated by Jack Gilbert at Chicago's Argon Laboratory. Jack - We need to understand how the microbes in the ecosystem control ecosystem health, hence, the Earth Microbiome Project wants to investigate microbes around the world. We're trying to understand what they're doing in each ecosystem and how that is affecting the way the ecosystem functions and the services it provides. Tim - Jack Gilbert previously worked at the Plymouth Marine Laboratory to analyse microbes in the English Channel. His team found that there was a marked seasonal cycle so that a much greater variety of bacteria was found in the winter than in the summer. Professor Dawn Field, also from the Centre for Ecology and Hydrology collaborated in the research. Dawn - There's been a lot of debate for a long time about whether microbes are everywhere, so that you have the same stock of microbes in every place basically on earth but that the environment selects out only a few to be very, very abundant. Or if we really do find completely different communities in different locations. And some further work that we've done there actually suggests that in many ways the same community is there, it's simply a shift in the proportion. So at different times of the year certain microbial lineages do much better and start to bloom up, so to speak. Tim - So it's more that you're just detecting them at particular times of year, but they're always there? Dawn - Exactly. If for example, you wanted to do remediation in terms of the oil spill, it was more effective to put nutrients on that oil spill and pull out of that background the kinds of microbes that could eat oil, than it was to introduce new microbes. Helen - Dawn Field there from the Centre for Ecology and Hydrology with Tim Hirsh reporting. David - Proteins carry almost all the basic functions in your body. They're essentially like the machines. They have very precise three-dimensional structures which are critical to them carrying out their function. What we're working on is trying to make new machines, new protein machines that do new things. Chris - If we were to zoom in on an enzyme, and ask how does this thing actually work, what would be the answer to that? David - You see, on the outside, you see scaffolding that would hold certain groups in the enzyme in very precise positions to carry out the chemistry of the reaction. Chris - And what's the business end? How does that scaffolding then make a chemical reaction happen in the way that enzymes do? David - It provides a very precise chemical environment in which the rate limiting step for the reaction is greatly sped up. You have all the right types of positive and negative charges in the right places to speed up the reaction. Chris - So if we were looking at an enzyme active site, which is where it does the chemical reaction, you'd have a region of the protein which is just the right shape to fit a molecule into it. And then the right sorts of chemical groups are in the right places to transfer charge, or to distort, or move, a molecule around in order to make something happen. David - That's exactly right. Chris - So nature does this very well. I mean, our bodies are a big bag of chemical reactions. You're saying, we can take what nature does, work out how these things work, and make new ones? David - Exactly. So we can take the basic principles for how the proteins in nature do things and then try to make new proteins that do new things that are of current use to the society, as we face a lot of problems that nature didn't face during biological evolution. Chris - Presumably, it's not trivial to do this though because if one takes a look at an enzyme, you've got something of several hundred amino acid building blocks in the protein, and there are many, many different amino acids existing in nature that could be in any of those positions. So there are many possible combinations that could give the structure. So how do you solve a problem like that? David - Yes, you're right. There are an astronomical number of combinations, the number of possible amino acid sequences. The way we approach this problem is by focusing on the active centre where the chemistry is going to happen and we build models of what the perfect active centre would be, that would catalyse the chemical reaction. And once we've done that, we try to come up with a scaffold that will hold all of those key groups in position to carry out their reaction. Chris - How do you decide what chemical groups have got to go where though? David - We decide what chemical groups should go where based on quantum chemistry calculations and based on chemical intuition about how the reaction is likely to be sped up. You actually commented on a couple of the ways we might do this. For example, suppose you have a reaction in which there are two molecules that come together to be joined into one molecule. In solution they'll be floating independently of each other and it's very rare that they would actually come together in exactly the right relative orientation for say, a bond to be made between them. In a designed enzyme, you would design a binding site for one molecule, a binding site for the other molecule, and they would be held in exactly the right orientation so that the bond could form between them. Chris - You made that sound very simple, but I'm sure it's not. David - Well it's not. There are basically two problems. First of all, we are making a bit of a hypothesis about how you might speed up the reaction. I mean, in the case I just gave you, it seems quite intuitive that if you brought these molecules together and held them in the right relative orientation, you would speed the reaction. But that's not always true. And the second difficulty is, we may want to be able to create binding sites that hold the two molecules in the right orientation relative to each other, but achieving that is a tall order that really requires mastery of the rules of protein folding . We'd like to design an amino acid sequence so that the protein folds up in such a way as to create these two binding sites. So both of them are challenging problems. Chris - Now you mentioned amino acids. Nature endows us with a clutch of these things that we use biologically. I mean, most proteins that you will find in my body should have one of the 20 commonly used amino acids in them. Presumably if you can bespoke make proteins though, you're not constrained in the same way nature is, so you could do kinds of exciting reactions. David - Yeah, exactly. So we are now trying to create designed proteins using more than just nature's 20 amino acids. Chris - What sorts of functions could you do with that? David - One thing one might be able to do is bind metals that aren't normally bound to naturally occurring proteins, like ruthenium, that could have uses in, say, light capture. You could incorporate potent chemical functionalities that aren't found in nature to carry out more complex reactions. Chris - So you can basically do chemistry that nature can't if you understand first of all how nature has come up with the structures that it does. What about doing things beyond just enzymes though, because proteins do all kinds of things, they don't just catalyse reactions? David - Proteins do many different kinds of things. Another thing that they do is they bind tightly to other proteins and to targets - so, for example, the way that viruses and bacteria get into your body. They have proteins on their surface that recognise protein receptors on your cells and this is sort of the first step in entry into your body. So, molecular recognition is important function carried out by proteins and this is something that we're actively working on. We've recently designed very small proteins that prevent the flu virus from infecting cells, and we're now engaged in making small protein inhibitors for the entry of many different types of pathogens into cells. Chris - In other words, by understanding the structures that the microorganisms themselves use to latch onto a target cell and then penetrate, if you understand what the virus or the bacterium is doing, you can produce a complementary protein or molecule which will interrupt that process because it binds to it better than a cell would. Chris - So how far are we away from being able to come up with some kind of generic recipe book where someone would say, "Right. I have got a certain structure or certain target for - whatever microorganism that's the flavour of the month - I want to interrupt the infectivity of that." Can you do that yet? David - Well, that's exactly what we're working on and our goal is exactly as you described, to create a sort of general process, a rapid process where given a new pathogen, you could point to a region on its surface and say, "Block this," and a couple of weeks later, you'd be able to block it. I could say we're also trying to engage the general public in these efforts because we have an online video game called 'fold it' in which the public can get involved in both the enzyme design and inhibitor design. And in fact, in recent months 'fold it' players have been making very exciting contributions in both areas. Chris - How long does it take you to come up with a bespoke molecule that could block flu the way you've described? David - It took us about a year and a half. Chris - And that's involving millions of computer hours around the world. Chris - So this is not a trivial problem to solve. David - No, not at all. But we're at the beginning and we're hoping that as we learn more about how to do this, we'll be able to do it more quickly. Helen - We've just heard how the structure of proteins is vital for their function, but does the same thing apply to other types of molecules we might want to set out designing for ourselves? Graeme - Yes. Well I'm looking particularly at much smaller molecules than proteins, and we're not just interested in the molecular structure itself but in the material structure that we get when we crystallise a molecule. Helen - So that's when you put lots of molecules together to make a bigger chunk of that stuff essentially. Graeme - To make a solid state structure, and the most stable solid form of molecules, is to make a crystal structure where the structure repeats periodically. Helen - So presumably, the structure within the molecules will then tell you about how it's going to form a solid structure when you've put lots of molecules together. Graeme - Well, a lot of what we're trying to find out is how the molecular structure relates to the crystalline structure that you end up with when you crystallise a molecule. This will have to do with how the functional groups, sort of the arrangement of atoms on a molecule, line up against each other, and the favourable ways that these functional groups want to line up against each other will dictate the way that the molecules arrange when they meet each other in solution and crystallise. Helen - Right. So how are you actually going about modelling and predicting these structures of molecules, and the crystal structures when they come together? Graeme - Okay, so I've been working on this problem of crystal structure prediction for quite a few years now. We're trying to develop computational models where we can take a molecule, even before it's synthesise d, so just the picture of the molecule, say, the chemical diagram, and then we use quantum chemical methods to come up with the three-dimensional structure of that molecule itself. 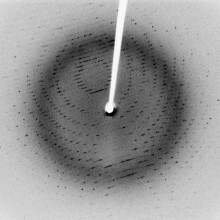 We put that into a computer then to tell us all the possible ways that that molecule can pack into a crystal structure. Helen - So essentially, you're drawing your molecule and from that, you can begin to understand how you think it's going to behave. Graeme - Yes. So we want to then predict how the crystal structure is going to form and that's going to then relate to the properties that we get out of that material. Helen - Excellent and what sort of factors do you need to take into account? I mean, it sounds to me in my head, I can see a computer screen with balls and atoms all arranged into a molecule, and then it's just a case of almost fitting them together like a jigsaw puzzle. I'm sure it's not that straightforward, but what sort of things do you have to take into account? Graeme - Well it is a lot like a jigsaw puzzle actually. Molecules want to fill space as efficiently as they can when they crystallise, and what they're trying to do when they fill space as efficiently as they can is to find the minimum free energy, so the very lowest energy structure that they can form for a crystal. So what we're trying to do is build up all the possible ways they can pack together, which ones are filling space best, and then we calculate very accurate energies of all of these possible crystal structures to assess which one is the lowest in free energy, and then we assume that's going to be the most likely one you'll get when you go and make this molecule and crystallise it in the lab. Helen - So molecules are lazy in a sense and they want to have this low energy. How do we understand that energy use in terms of - you say there's a low energy form? Graeme - Okay, so what that's made of and most of the dominant term in the free energy is the potential energy and that's really just an interaction between those molecules. So you might have strong interactions like hydrogen bonds, and that has a very low energy itself, that's why that hydrogen bond forms, so the molecules are going to arrange themselves to make as many of those favourable interactions as they can, because they have a lot of this negative potential energy which leads to a very low free energy. You can, under very specific conditions, try to make metastable crystal structures. They might have different properties and then you're trying to derive it into something which is not the lowest free energy state and then you'll get a metastable structure. Helen - Okay and can you also work this backwards? Can you say, "Okay, this is the structure I want. I can now go about actually creating that"? Graeme - Yes. Well, we have some sort of empirical rules like these hydrogen bonds. We know what functional groups want to line up against each other. We're trying to put this more in a very reliable computational model so that we can try to say, "I want this end structure, this type of arrangement of molecules in my crystals, how can I draw a molecule that's going to lead to that?" And we can then do experiments in the computer to tell us which are the most likely molecules that are going to give us that structure. Helen - And once you can predict a structure, can you take it a step further and predict the properties that are going to come out of that structure? Is it going to be that easy to go from one to the other? Graeme - Well this is the grand aim. We don't want to just come up with a nice beautiful looking structure of a crystal. Really, what we want to design its other properties and the structure of the crystal is going to affect things like maybe the colour or the hardness, the solubility, or maybe some interesting properties like charge transport for making semiconductor crystals. So, some of these properties are easy to predict, some of them are basically just determined by the arrangement of atoms. Some are quite difficult to predict - things like solubility and there's still a lot of hard work that needs to go into that, but we're plugging away at these different properties so that we can put all these together and try to design properties from scratch in the computer. Meera - For this week's Naked Engineering, Dave and I have come along to this site of Industrial Chemicals Limited based in Grays in Essex. Now as their name might suggest, they make chemicals for industry and they do make hundreds of thousands of tons of chemicals here each year. Now Dave, why have we come along today? Dave - Well chemicals are such an important part of our everyday life. They're the fundamentals of everything from plastics to hair products to washing up liquid, and my only exposure to making chemicals is in a lab where you take a few grams and if you're feeling extravagant, mix them up and you get something else at the end. But on an industrial scale, it gets entirely different because you're talking of thousands and thousands of tons of these chemicals made every year which is a completely different proposition. Meera - So to find out just how chemicals are made on such a large scale, we're here with Chief Chemist for Industrial Chemicals, David Compton. Now firstly I guess David, what range of chemicals are made here? David C. - On this particular site, we make inorganic chemicals that are used for either the water treatment industry or for soaps and detergents. The basis for our technology is aluminium chemistry and we're actually standing inside the incoming bay for our aluminium hydroxide material which is one of our prime starting materials. Meera - There are just mountains of it here, over 10 meters in height, and we're just surrounded by a powder of it. David C. - This building will actually take 4 or 5,000 ton shipments. It's a very useful material for us because aluminium as a metal is amphoteric which means that it can either be reacted with acidic substances or with caustic basic substances, and we do both on this site. 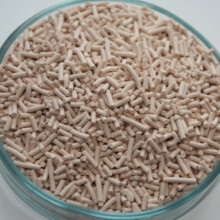 We can use hydrochloric acid to dissolve the aluminium hydroxide and form aluminium chloride, which is an important chemical for the water treatment business as a coagulant, or we can dissolve it in sodium hydroxide and make sodium aluminate, and this is the starting material for one of our key products which is called zeolite. Meera - What is zeolite? Why is that an important compound? David C. - Zeolite is a very useful material because it's a framework of atoms, aluminium and silicon atoms, built up to form a structure which can actually have spaces in the middle, voids, and those voids can hold different atoms. Depending on which zeolite you use, you can hold anything from water molecules right up to large organic molecules in these structures. The one we're using is called zeolite-A and that's very important in the manufacture of washing powder. It can actually absorb calcium and magnesium from the water. It acts as a softening agent. Meera - So you've mentioned to make this you need sodium aluminate which we've made with the mountains of aluminium hydroxide around us here, but what's the second ingredient? David C. - The chemical name for zeolite is sodium aluminosilicate, so we need some silicate as well, and we make sodium silicate and mix that with the sodium aluminate to form zeolite. 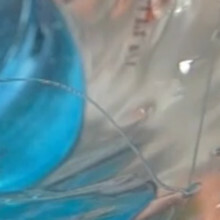 The sodium silicate is made from a similar mountain of sand, just straightforward silica, again dissolved in caustic soda to make sodium silicate. Meera - So there are mountains of aluminium hydroxide around us and this is being moved on conveyor belts, 10 meters or so above us, over to another building where there are reaction vessels, large ones in fact. David C. - Inside the reactor, first we charge sodium hydroxide solution into the bottom of the vessel, start the stirrer and then we start adding the aluminium hydroxide. We then add steam to the vessel to increase the temperature up to the point at which it can react. To make the full solution takes time, temperature, and stirring. Meera - So we've moved around to the reaction vessels where these two core ingredients for the zeolite are actually combined. David C. - We take the sodium aluminate and the sodium silicate, mix them together, and they form a gel like a great big jelly pudding. If kept at a high enough temperature for long enough, that actually crystalizes and little tiny cubic crystals of zeolite fall to the bottom of the reaction vessel. It takes about a four-hour cycle for the reaction to go to completion. Meera - The reaction vessels themselves are just gigantic. They're about 30 meters high - I'm craning my neck here to look up at the top of it! How much of these ingredients, and how much zeolite is being made here? David C. - We're putting about 80 tons of the starting materials into one of these reactors and dropping out about 20 tons of zeolite products. So, 60 tons, which is what we call the mother liquor, then goes back and is recycled back into the process. Meera - So once these have combined here and you've got these crystals forming, and so on, what happens next to get your zeolite? David C. - So at the end of the reaction, you've got something like 20 tons of powder but it's mixed up with the rest of the solution, so we empty the reactor straight over to what's called a filter press which we're going to have a look at next. Meera - So we've come through now to where the filter press is located. So this is really where the zeolite you've made so far is essentially pressed together to get your final product. David C. - Yes. The filter press is a large hydraulically-driven ram which squeezes the material between cloths. The cloth lets the water out and zeolite powder stays in. Meera - So essentially, there are just, say, 50 sheets of this cloth all parallel to each other and that's what's really being pushed together with this 'slurry' in it to dry it. David C. - Yes. At that point, it's probably got 40% of water still in it so it's a wet cake. This is dropped out from the bottom of the press at the end of the procedure and then passed via conveyors to drying ovens. Meera - There's a really interesting point to remember about zeolite in that there are different forms of it that could be made and this is what you really need to control. David C. - We control the actual type of zeolite that's made by the formulation, by the actual ratio of the sodium to silicon to aluminium and that's very carefully controlled throughout the process. Otherwise, we end up with the wrong zeolite which doesn't have the correct function. Dave - So essentially you end up with a structure with the wrong sized holes? David C. - That's correct: if we end up with the wrong sized holes, they won't absorb the calcium and magnesium and won't function as a water softener. 47:17 - How are newly created molecules tested in terms of safety? 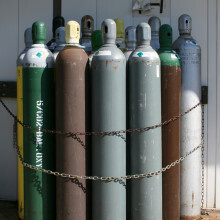 How are newly created molecules tested in terms of safety? Chris - There is this whole question about nanohazard, isn't there? Are people worried particularly and what they're doing to make sure that when we generate tiny things like carbon nanotubes and thing they are not going to be the next asbestos. Graeme - I guess that's true so you'd need again, if this is going to be something which people are going to be around then they need to be biologically tested to make sure they don't interact in nasty ways with people. 48:31 - Can the properties of a virtual molecule be predicted? Can the properties of a virtual molecule be predicted? Graeme - There are some quite sophisticated computational methods based largely on quantum chemistry, which we can use to determine the properties of a molecule. Now the accuracy of this depends a lot on what property we're trying to predict. Some are easy, some are very, very difficult, and people are having to work very hard to get the methods up to a good enough accuracy to try to predict. So, we know obviously we can predict the shape or the size of a molecule. We could then from that predict say, the density of a structure, or even the colour is reasonably easy to predict. Other things, maybe, I don't know, the solubility of the material, relates both to molecular structure and to the crystal structure, and that's notoriously difficult to predict. So it really depends on the property you're interested in, whether we can predict it or not, but we're trying to make the methods as widely applicable as we can so that we can predict and design lots of different types of neat and interesting properties. 49:52 - Do scientists get scared of destroying the world? Do scientists get scared of destroying the world? Graeme - Well, most of my work is actually on a computer, so that's fairly safe, so unless the computer is going to blow up itself, then we're okay. Other scientists? I guess it depends. Chemists, I don't think there's a big risk that we're going to blow up the world. Helen - I think us Marine Biologists are fairly safe as well, but it's always something worth bearing in mind, I think, destroying the world accidentally through science - no, no, no. 50:22 - Can bubble bath keep a bath warm for longer? 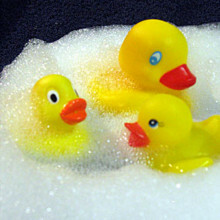 Will a bubbly bath stay warmer for longer? What else can I do to keep my bath at the perfect temperature? We put this to Professor Eugene Terentjev from the Cavendish Laboratory at Cambridge University. Eugene - Basically Steven asks this working on the assumption that a layer of bubbles would thermally insulate the top surface of the water, like a bubble wrap would insulate a hot or cold object. This is correct - it will reduce the heat loss through the top surface, both in straight diffusion of heat into the air and in water evaporation, which is a very efficient mechanism of cooling by phase transition. Of course, one has to have very stable long lived bubbles in this form covering the water surface, which can be achieved by the use of good surfactants and salts, although I don't know how good for your health all that would end up being! But my instinct tells me that both of these mechanisms of heat transmission and water evaporation off the top surface, whether insulated or not, are minor in the overall process of a bath cooling down. Let's conduct an imaginary experiment and cover the top surface of a hot bath with many layers of bubble wrap. I don't think the rate of its cooling will much diminish. I think the direct contact of water with the solid mass of the bath tub body is a much more efficient sink of heat. This is because the transfer of heat into the low density air is generally very poor. In fact, it is air filling the bubbles that is supposed to be the thermal insulator in Steven's original question, and we know how thin air cavities inside wool hairs make wool clothes so warm. Diana - As techmind said on our forum, a layer of bath bubbles does indeed keep the bath warmer for longer but be wary of the old style cast iron bars. They're elegant, and will tend to conduct heat away from your water faster than a more modern acrylic bath will. But from pondering to practice, here's Dave Ansell to explain what he found experimentally. Dave - To test this on a slightly smaller scale, I took two identical washing up bowls, filled them up 10 centimetres deep with water from a hot water tap, then I took some bubble bath, put it in one of them, frothed it up so you have a nice layer of bubbles over the surface, and left the other one. I then put two thermocouples, one in each bowl in exactly the same place then I waited to see what happens to the temperature. They both started at 44 degrees centigrade and after an hour, the one with bubbles was at 38 degrees centigrade, but one without any bubbles was down to 34 degrees centigrade. And when I looked at all the results, pretty much all the time, the one with bubbles was losing heat at just slightly more than half the rate of the one without any bubbles, which means that the bubbles are actually working as a very, very effective insulator. I think this result should work on a bath as well: on a bath, the surface is probably going to be slightly more important because relatively, there's less side compared to top and bottom on a bath, and I was using about the same depth of water as in a shallow bath. So you should find exactly the same thing happening when you bathe.